Hello there! 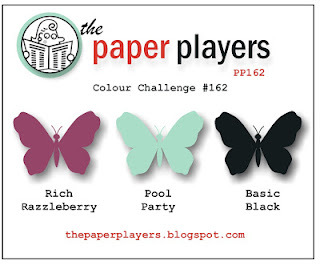 This week over at the Paper Players, the ever fabulous LeAnne has come up a fabulous color combo to try. Isn't this mix of Pool Party, Rich Razzleberry and Basic Black just gorgeous? To be honest, my card was actually 2 different cards before I just decided I was over-complicating the process trying to add too many bells and whistles to my card. I also smudged some black ink right across a water colored image on my second card as it was 95% complete, which made me want to throw in the towel. Ugh! I finally just decided to keep it clean and simple and let the colors take center stage. I guess I was inspired by the trio of butterflies in the challenge graphic, too. I added the little pop of pattern and chevron embossing along with raising up the butterflies and the oval with Stampin' Dimensionals. The sparkle adds a fun finishing touch. I have listed all of the supplies at the end of the post. Please join us over at the Paper Players! The challenge is open through Friday, September 13th, 2013 at Noon (PDT). Stop by and say hello to the rest of the Design Team to see what they are sharing this week. Love this combo! Gorgeous card, AM! Very pretty Anne Marie, love your glam butterflies! Oh, I am so sorry you struggled with your cards....I know all about SMUDGES!! Grrrr! But you really nailed the colors with this beauty! Those butterflies are just gorgeous, and I just love the polka-dotted panel with the black scallops! Delicioso! Oh, no I hate those darn ink smudges! I always somehow manage to get ink all over myself, LOL! Such a pretty card Anne Marie. I'm a sucker for polka dots and I love your sparkly butterflies. I really love your card, Anne. In fact, love all the team cards this time! You all are real inspirations. Thank you. It's a very pretty card!! Simple and beautiful...simply beautiful! The rhinestones perfectly accent the butterflies! This is a gorgeous card, AM. I love how the colors pop against the white--looks much better than my card with the vanilla. You've really shown how beautiful the colors are together. Everything is perfectly balanced. Great texture and sparkle too--as always! Big hugs to you! So very pretty Anne! Those butterflies are beautiful! Love the bling and embossed background! Thanks for the inspiration!